Jeff Browning is a talented high school debater who stands a solid chance of winning a scholarship to the college of his dreams. When Christy, his girlfriend, announces that she is pregnant and she will neither have an abortion nor give the baby up for adoption, Jeff is forced to deal with the consequences of his actions. Ready or not, Jeff is going to be a father, and the course of his life is changed forever. Directly from New Wind, from Barnes and Noble, Amazon, or your local independent bookstore. Also available in Perma-Bound editions and from Follett. For bulk orders, see our Bulk pricing order form Hamilton High or contact orders (at) newwindpublishing.com. Do you like real life stories filled with action and a catchy beginning? Well this is the book for you. You'll actually feel the character, from emotions to what there going through and probably even shed a couple tears. Yup, that's right! You'll feel how it is to be lonely and have an idea of how a pregnant teenagers life is. 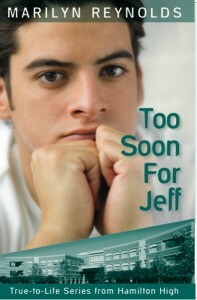 — Ivette V.
Too Soon for Jeff has also been translated into Chinese (not available through New Wind Publishing).